The overnight run to Mount Isa was another case of plenty of excitement but not much time lost. Indeed the leading group of cars would not lose any time despite the massive dust hazard, masses of bull dust and wandering cattle. Others would lose time, such as Portman who craked the rear axle housing, and Carr, who was languishing down the field after time loss at Borroloola, and whose Cortina needed more work along the way. This stage was described as “50% good gravel, the remainder is a graded dirt bulldozer cut track. Bull dust hazard is extreme”. The organisers had set a 78 km/h in appreciation of the extreme dust hazard, and there was little doubt that the leading cars would make it on time. Interestingly, this road is now part of the Savannah Way tourist trail and is a pretty good well maintained road. In 1979 the NT side was pretty good but some of the Queensland part was quite bad, with criss-crossing bull dust filled tracks through scrub country. The first car set off into this stage on time at 8.15 pm on a warm clear night. The order on the road was Brock, Ferguson, Mehta, Nalder, Barth then Davis, Portman, Dunkerton and Herrmann. The road is indeed good gravel with a few sharp dips and creek crossings for about the first 200 km. After Calvert Hills Station it became a narrower dirt track meandering through some hilly country before emerging onto the plains again towards the Queensland border. Back in 1979 there were quite a few gates on the road, mostly closed, including the one at the border which had a small sign on it saying “Welcome to Qld”. Davis was pushing and passed Barth, perhaps when the Porsche punctured. After the border it was quite a good track meandering through Gulf savannah country through to Westmoreland Station after which it entered a section of criss-crossing tracks, many deep in bull dust (fesh fesh). The bull dust ruts were so deep in places it was like mud, even though it was bone dry, and many cars would get bogged. Richards bogged the Nalder Celica briefly but allowed Davis through. Bull dust also creates an extreme dust hazard and on the warm night the dust would hang in the air for a very long time, much longer than the nominal 2 minutes between cars. Only Brock would have a clear run. This section is where the Hells Gate Roadhouse now operates but it was not there in 1979! 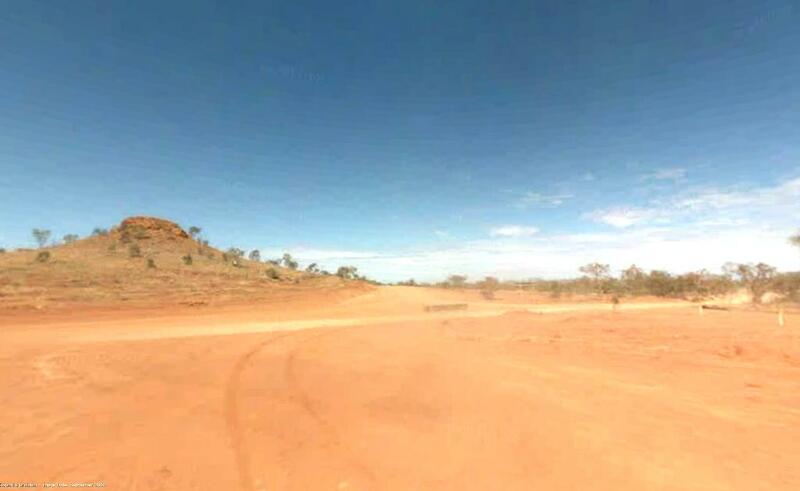 By Doomadgee Mission the road had improved into a good dirt track but the dust hazard remained extreme. Just past Doomadgee cars crossed the Nicholson River on an eerily narrow 500 metre long concrete causeway. In this region the Nalder Celica with Richards driving hit a cow but the damage was minimal. About 10 km from the end cars crossed the Gregory River but here there was water flowing over the narrow concrete causeway which formed a long right hand bend. Drivers needed to watch the lip where the water flowed off the edge to judge where to drive. Ferguson dropped a wheel off the edge and became stuck but a 4WD was there and pulled the Commodore out. This stage was all about dust and bull dust. If you got a mostly dust free run you could certainly clean, as did six of the first seven cars on the road. Portman was slowed by a cracked rear axle housing, dropping 39 minutes, and would need work done at Burketown but their service crew was not there so they’d have to wait for Mount Isa to make real repairs. Makeshift repairs were made in Burketown after they located a welder at 5 am! Carr lost time due to his road position and did well to only drop 9 minutes. The section of bull dust must have become very chopped up and many crews would have gotten stuck there for varying periods as the times reveal. Fury probably got bogged, dropping 55 minutes. This stage was simply a run into Burketown and back, 25 km each way, on a fast, albeit dusty gravel road. Only 15 minutes was allowed for refuelling and time to grab some barramundi fish and chips. However time was allowed for the gimmick of the passport checkpoint established by the Burketown Shire Council to highlight the condition of the local roads. 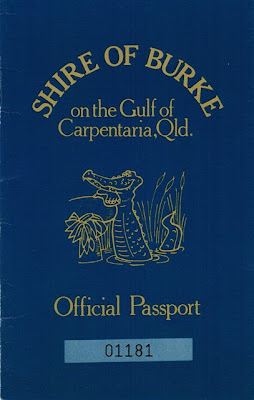 They charged a small fee for the passport but it included the fish and chips! It seemed that all the locals were out in force in Burketown (it was 4 am) and many looked like they’d been drinking all night! Quite a few crews were late a few minutes, perhaps enjoying their fish and chips too much. Portman did well to get some welding done and only drop a minute. Some crews just took fuel and raced back to the control, booking in as much as 20 minutes early in order to regain precious late time. Watson supposedly had a run-in with the local costabulary who demanded the removal of the hub extensions on the rear wheels of the Peugeot that were part of an interesting winching arrangement. Others lost a lot of time having to carry out work on their cars, generally without the assistance of service crews who were waiting in Mt Isa. The Giddings Datsun had hit a gatepost and needed work. It was not clear why this stage was not simply joined to the Burketown transport but perhaps the organisers expected some delay at Burketown. Anyway, this was a straightforward run down the good gravel road to Gregory Downs, where the town really is just the pub. Nowadays this is the turning off point for Lawn Hill National Park and the Century Zinc Mine. The stage was quick though, with a 101 km/h average! Quite a few cars dropped a few minutes, including Dunkerton (1 minute), Davis (5 minutes), Jackson (8 minutes), Hilton (14 minutes) and Portman (25 minutes). Surprisinlgy, some crews managed to book in early, including Giddings 10 minutes early which meant he averaged 124 km/h, or perhaps it was just a misread road card by the scorers! The majority of this stage was the main road from Gregory Down to the Barkly Highway towards Camooweal, and while it is fast gravel it is through undulating country with many yumps, dips and grids. The last part turned off towards Mount Isa emerging onto the Barkly Highway at a place called Yelvertoft, but also on a pretty good road. It was a quick 100 km/h average, but certainly cleanable. While dust continued to be a hazard, fatigue was probably a greater hazard for crews attempting the stage in that difficult few hours before dawn. While 12 cars cleaned, times started to stretch out down the field for reasons that were generally not recorded. 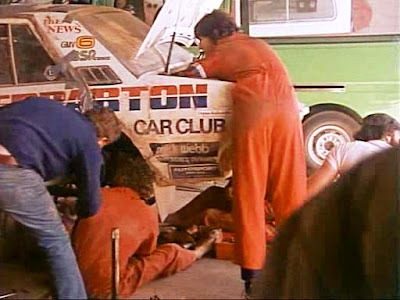 For example, Watson's 44 minutes suggests a problem with Gidding's 49 minute loss may have been associated with the reported loss of a wheel when someone forgot to tighten the wheel nuts. A total of 46 cars completed the stage with 4 cars that went to Burketown cutting and running along the bitumen from Gregory Downs to the Burke & Wills Roadhouse and then to Cloncurry and heading straight for Townsville. On the other hand, 32 cars visited the end control having not done the stage, but having cut and run from Borroloola or Darwin. 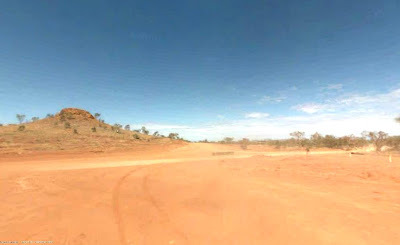 It was an easy run along the Barkly Highway to Mount Isa for a scheduled one hour break that had been cut to a 30 minute break due to the late departure from Darwin. This was not a lot of time given that you needed to refuel and try to eat some breakfast! Many cars booked in early to regain late time while a few were late by a few minutes. 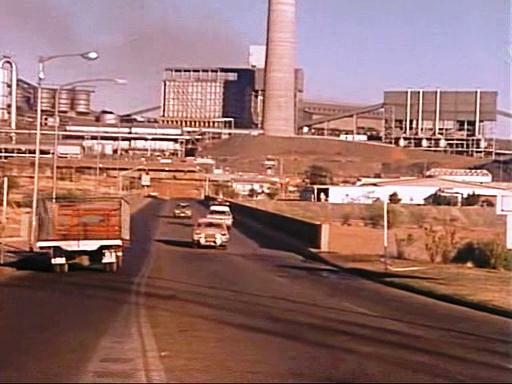 Hilton was 12 minutes late with continuing problems although most cars that needed extra work would lose time on the transport leaving Mount Isa. Portman would need a new rear axle while the Jacksons were changing the engine in their Commodore. 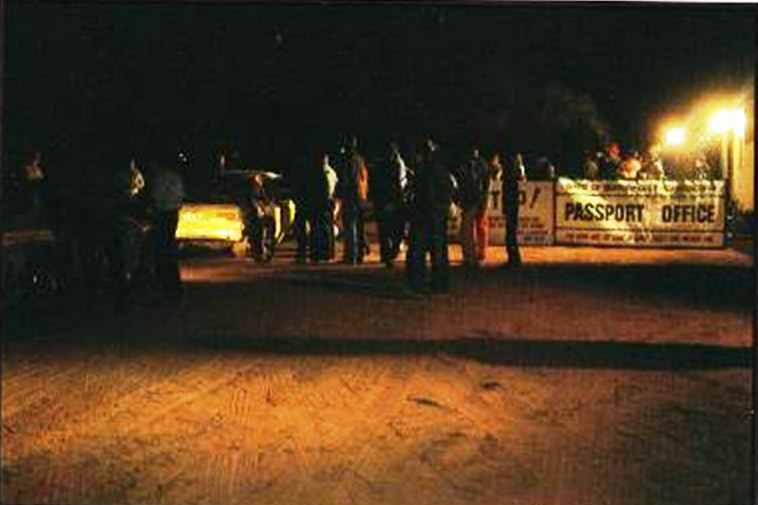 Wes drove out of Borroloola and into the next trial stage which we started at 8.38 pm. I managed a fair bit of sleep despite the occasional dip and creek, some with water in them. Somewhere near Robinson River we punctured and I stayed in the car to ferry the wheels in and out. As we headed off there was no sign of the Porsche or anyone else behind us. The road became more twisty and turned to an earth surface around Calvert Hills and there were quite a few gates. We changed drivers at the border gate. The next section of track was fairly tight through scrub country and good fun but after Westmoreland it turned to a maze of tracks with a lot of bull dust and a lot of choices. We were close to getting stuck a few times in the deep ruts and eventually did and had to winch a few metres to get out. We were up to our knees in fesh fesh! Davis went past just as we were packing away the winch but no sign of the Porsche. The run through to Corinda was tricky in the dust as you couldn't see the choices until they were upon you but we had to push to make sure we didn’t get stuck. I went off the track in one spot but there was nothing to hit. Geoff said we were doing OK on time and would probably be early so we didn’t take any silly risks. The causeway over the Nicoholson River after Doomadgee was very eerie. Soon after we were in light dust at quite high speed when I saw three cows in the middle of the road, so I braked heavily from 140 km/h. One went left, one went right and one ran up the middle of the road. It felt like we clobbered it quite hard but we had a flexi bar on the front and it seemed to bounce off and was flung off the road. We weren’t going all that fast by the moment of impact and I think the cow was actually OK. The damage to the car was minimal and we slightly straightened the bull bar in Townsville. The crossing of the Gregory Rover was even more eerie with water over the causeway but we had no dramas. We arrived about 5 minutes early and Mehta and Davis were there. Barth also arrived on time while we were there so Gil went back behind both us and the Porsche. 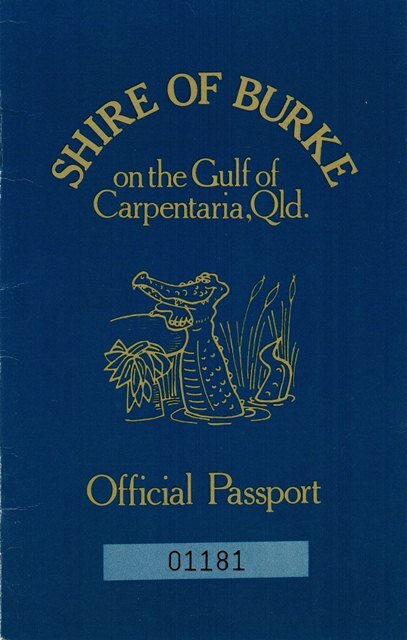 I continued to drive into Burketown which was a bit of fun. The place was certainly abuzz! The barramundi fish and chips were great. The service boys in the plane were there and changed a blown Super Oscar bulb but everything else was OK. I kept driving back through the passport roadblock and to the control and headed down to Gregory Downs while both Wes and Geoff slept. I was conscious that it was a quick time even for a transport and pushed along but I was getting very tired by the end and was pleased to get in the back for a sleep while Wes drove the next competitive. I was awoken a few times on the fast Big Dipper stage when we went over yumps and grids and landed heavily. I was still very tired and hardly woke up at the control as dawn was breaking. Geoff drove into Mount Isa while Wes and I both slept.